Lady of Perpetual Chaos: Blogiversary?! I can't get it to work right. It looks the same but says "I'm a Comment Junkie". You know what my vote is!!! lol I like them both... that is helpful huh? I say #2, #1 just doesn't fit you, but your great love of things off-the-wall and unique makes you a perfect #2! I'd go for #2 personally (no offense to Kristina). 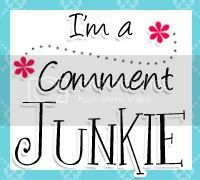 I like junkie because I am a total blogging junkie. Maybe I am a blogging whore.....yikes! I do feel like I am a stalker sometimes. whore. always go with whore. Personally, I am a wee bit rebellious too, and the whore one gets my vote!